Greater NOIDA, September 5: Amateurs Tanirika Singh and Rhea Saravanan ruled the roost in the opening round as they were placed first and second respectively after the first day at Jaypee Greens in Greater Noida. Tanirika showed her liking for the course as she carded one-over 73 in the opening round and Rhea shot 3-over 75 to be Tied-second alongside one of the favourites, Amandeep Drall, who has won three times this season. Tanirika, one of the upcoming and promising young amateurs, who has been gaining valuable experience playing alongside professionals whenever possible, took a one-shot lead over the field which has many bigger names. She incidentally finished third in the fifth leg of the Hero WPG Tour, when the event was held at the same course earlier this year in February. She played a clean and steady round with one birdie on the par-3 12th, but dropped shots on the seventh and the closing hole, the 18th. She parred the rest. Rhea started well with birdies on the first and third, but dropped shots on the fourth, ninth, 10th, 13th and 17th. The two leading professionals were Amandeep Drall and Afshan Fatima, tied at 75. 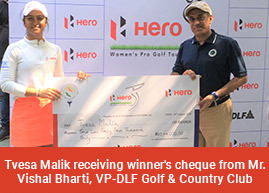 They were followed by Siddhi Kapoor, Tvesa Malik and Gursimar Badwal, who shot 76 each. Gaurika Bishnoi carded 78. Amandeep Drall had four birdies, but she also had seven bogeys on a highly eventful day. Gaurika Bishnoi (78) and Neha Tripathi (80) were among the top stars who had a poor day. In the second round, Mehar Atwal and Millie Saroha will go out in the first twosome, followed by Khushi Khanijau and Neha Tripathi in the second 2-ball. The third group has amateur Khushi Hooda, Suchitra Ramesh and Anisha Padukone, while the fourth group will see Ayesha Kapur, Gaurika Bishnoi and Gursimar Badwal. Tvesa Malik, Siddhi Kapoor and Afshan Fatima will tee off in the penultimate group, followed by the leader group of Amandeep Drall and amateurs Rhea Saravanan and Tanirika Singh. Copyright © 2018 WGAI . All right reserved.